A dash light is a very easy and affordable way to outfit the interior of your vehicle with caution or emergency lighting. 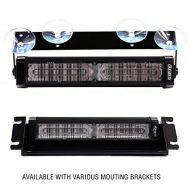 The Feniex Fusion 2X LED Dash Light is the brightest deck/dash light in emergency vehicle lights. With interchangeable modules, the 2X deck light/ dash light is extremely versatile and can cater to long and wide range needs. The Feniex Fusion 1X LED Dash Light is the brightest deck/dash light in emergency vehicle lights. With interchangeable modules, the 1X deck light/ dash light is extremely versatile and can cater to long and wide range needs. This 3 head unit is our most popular model since conception! This unit is easy to install and can be moved from vehicle to vehicle very easily! ****This product, along with all our products contain 3 Watt diodes (not 1 watt diodes)!! Our Dual head TIR style dash light is a very bright and affordable option! ****This product, along with all our products contain 3 Watt diodes (not 1 watt diodes)! !